Mexico City, one of the biggest cities in the world—the capitol of the 21st century, according to David Lida’s excellent book—seems to be a city of women. We are everywhere. We figure most prominently in the sidewalk stalls where women sell fruit and small necessities. They are small towns within themselves where people who must know each other from days of sitting and waiting for the rare sale gather for lunch around tiny grills, a real lunch of hot empanadas. Of course it is awkward to pass by, gawking, with a crowd of other well-heeled tourists from the U.S., and during our brief visit I often wished I had the courage to stop and speak a few words of my limited Spanish. Nevertheless, the women greeted us with bright eyes and smiles, as did all the people I saw in that teeming, unpolluted and lively city. In many ways, both good and bad, it does seem the city of the future, dominated by herds of cars and with fifty percent of the population living on something like ten dollars a week. Perhaps in accepting this troubling inequality, along with transportation tie-ups (not as bad as I expected), trucks loaded with bursting bags of garbage, and a fair amount of street dirt, we are only doing what we will eventually have to do. For we have overpopulated the earth. In terms of the art we saw, of all kinds and periods, women were poorly represented. This is true everywhere, as far as I know, and sometimes it seems that like traffic and street dirt we must simply accept it. 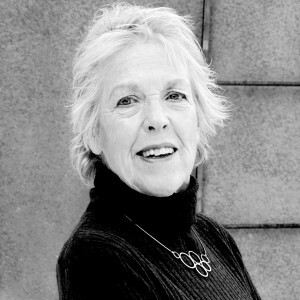 There are several outstanding examples of women in the midst of a barrage of male artists and architects. Clara Porset, whom I had never heard of, is one of them. Born in Cuba, with parents well-enough-off to allow her to travel and be educated in Europe as well as at Black Mountain College, where she studied with Joseph Albers, she returned to Cuba in 1959. Forging a working relationship with Fidel Castro, she designed furniture for one of the newly established schools, but left Cuba for Mexico in 1963, disappointed that Castro had not followed through on his promise to create a design school. She was widely recognized and written about, although always referred to as an interior designer, which in fact she was, but with major pieces of furniture such as the Butaque chair, made out of agave fibers with a sloping back. We saw several of these when we peered through the dusty windows of the house architect Luis Barragán build for himself, which is not open to the public. Because she was a woman, and because she designed furniture, not houses, Porset was not granted Barragán’s acclaim and fell out with him sometime in the 1960’s apparently because of her radical politics—which might have been called feminist. In 1993, when she died, Porset left her house to be sold, the proceeds to pay for two scholarships for women architectural students. When the money proved to be insufficient, it was diverted into the annual Clara Porset prize—open to both men and women. It seems a misinterpretation of her wishes. One of our guides, who is the new young director of the design galleries at the Metropolitan Museum in New York, may help to refurbish Porset’s reputation. His aim is to redo the Met’s rather haphazard design gallery with the intention of establishing interior design—furniture, fabrics etc.—as equal in importance to so-called fine art—and if he succeeds, it will mean a great deal to women, since the “crafts” and interior design have always been downgraded as women’s work. 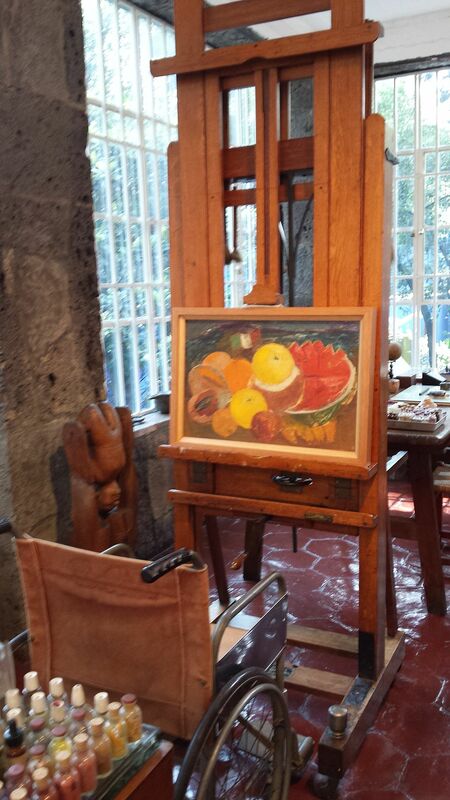 Frida Kahlo’s studio, by Martinica.ferrara. Wikipedia. In contrast, Frida Kahlo, whose La Casa Azul we also visited, is too well-known to need my introduction. 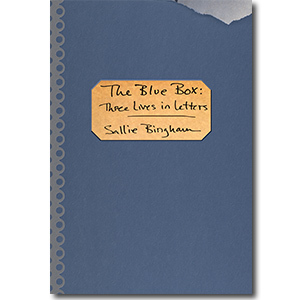 The little house on a side street contains her studio with all the implements needed for her painting, next door to her bedroom where she was often confined to her bed during the last decade of her life, perhaps somewhat comforted by the butterflies Noguchi gave her, pasted on the ceiling. Diego Rivera had his own house nearby with an enormous studio, overseen by a crowd of giant papier-mache Judases which according to tradition are burned on the street on Good Friday. Several ladies in our group were astonished that he also had a bedroom in Frida’s house, on a different floor, and kept insisting that surely they slept together. The same ladies couldn’t understand how a man as overweight and ugly as Diego—he called himself the Frog—could find favor with so many women. I sometimes think the flight of many people to other than the conventional gender roles is caused by the miserable narrowness of our definitions of those roles. What woman, if she had any choice, would want to spend decades in bed with the same man, and what woman has not admitted to herself that she is enormously attracted to an ugly fat man because of the sheer force of his vitality and confidence? Diego took advantage of his macho culture to indulge in sexual relationships with women other than Frida, which caused her a great deal of grief—unassuaged by the understanding feminists sometimes develop of the meaning of this behavior. But she remained more prophet than victim, in spite of the unrelenting emphasis on her physical and emotional suffering. Her paintings are far more than the expression of her suffering, even if motivated by it. 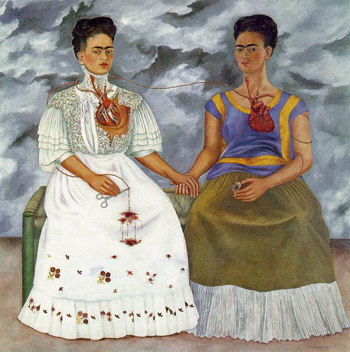 Her “Two Fridas,” a majestic double portrait given pride of place in the art museum, shows her using her own blood and internal organs to express her feeling. Both Fridas are perfectly dressed in white, both stare out with great determination, even while showing their innards. There can be no more powerful statement of a woman’s artistry. Another Fridaism on a wall at La Casa Azul delighted me because I often feel the same way as did Doris Duke—who was misunderstood because of it.